This is not an article I want to write, but I truly believe it could save a child's life. I never read any article like this before my son was diagnosed with Type 1 Diabetes. Maybe things would have been different if I had known all of the symptoms. Maybe my son would not have been more dead than alive when I finally took him to the Emergency Room. Maybe I would have taken him to the ER first instead of going to the pediatrician and then waiting overnight for test results. Maybe I would have asked more questions. I do not know how I am the mama that is Blessed. My son lived to tell the story. There are many children who do not make it. They are sent home, even from the ER without their Blood Glucose being tested. A simple, readily available test could save these children's lives. I was so traumatized by the whole thing, especially the fact that I did not insist upon medical care sooner. In my defense, my husband had just become disabled 2 weeks before, and our 15 year old dog had gotten really sick at the same time and had to be put to sleep after suffering a lot. I knew something was wrong with my 13 year old son, but it did not register completely because there was so much going on at the time. This is the 1st thing you need to remember about Type 1 Diabetes: It can be brought on by stress, or grief, so it happens right in the midst of lots of other things that vie for our attention. My son had lost weight. He had just had a growth spurt, so I thought it was that, but he kept losing weight. His elbows started look really large because his arms were so thin. We thought he had a stomach virus that would come and go. He would throw up for a day or so, and then feel better, but then it would come back. He was going to the bathroom, but he was drinking a lot of water and it was summertime... He sleeps on the other side of the house, so I was unaware of how much he was going to the bathroom at night. That is the thing, you think an older child would be able to tell you everything that is wrong. The sustained high blood sugar was affecting his mental clarity, so he did not communicate the other pieces of the puzzle that would have been a red flag. He also did not tell me that he had vision changes. My son had terrible acid reflux. This was the diabetic ketoacidosis, and it is deadly if left untreated. It took the Pediatric Intensive Care Unit 24 hours before they would even tell me if he was going to live. By time he got to the ER, he was grey and panting (this is Kussmal breathing). It is the final stages of ketoacidosis before coma. I thank JESUS that he spared my son. I have dealt with grief, anger – at myself and those around me - Something was wrong with my baby, and I let the doctors send me home!!!! 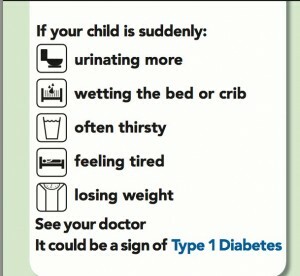 Please insist upon a blood glucose test if your child has any of these symptoms! It is my prayer that you never need this information. Please share this information with other mamas around you. Share it – It can truly be the difference between life and death! If you are a Type 1 Diabetes Mama, I bless you. I cry over your stories as I know you cry over mine. I am amazed by the Strength of your child, as I know that you are amazed by mine. I pray that Diabetes will not hinder you or your child. I pray that our children will walk in the fullness of their destinies, and that the LORD would send His angels to protect them, day and night. Type 1 Diabetes does not run in our family. It is not caused by being overweight, or by what my son ate. I am not a medical professional. I am the mama of an amazing young man who has Type 1 Diabetes. The above is to inform you and to share our experience with you. It is not to be misconstrued as medical advice. May The LORD Bless you and keep you and your.